One photo, three articles, and a video. Rubbish name for a film. 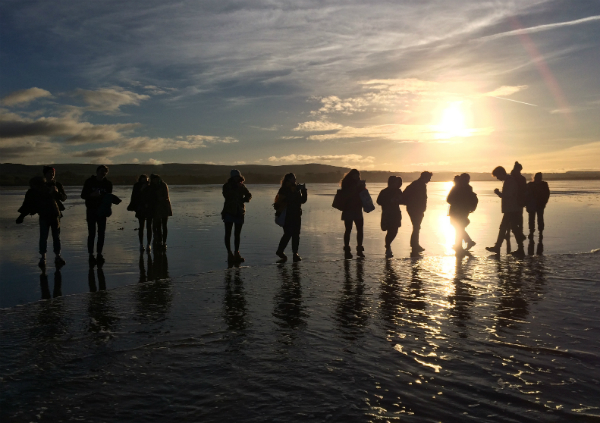 Scotland is mostly dark this time of year, and often rainy, but when it isn't those things it looks pretty special - as it did on Sunday afternoon when a group of us went to Belhaven Bay. Having lived in Bedford, Birmingham, and southeast London prior to Edinburgh, I'm still stunned on a near-daily basis by how beautiful a place can be. Mark Rowe found this out for himself when he took his family on a car journey along Scotland's newly-designated North Coast Trail. It's mebbies one to save for the summer when the winter darkness is paid back with seemingly endless hours of sunlight. God is excellent at making beautiful things, and the images NASA shows us of far-flung galaxies are one of the marvels of modern life. It takes a bit of work to make them look comprehensible to us, which is where the team at Adobe come in. An agnostic I follow on Twitter has wondered aloud several times about why the universe is so big. My answer is the beginning of Psalm 19: "The heavens declare the glory of God, and the sky above proclaims his handiwork. Day to day pours out speech, and night to night reveals knowledge." This doesn't mean that everything is beautiful, as we're all painfully aware. One of the Old Testament writers who can help us wrestle with this is Habakkuk, as Erik Raymond explains in his article, "Reading the newspaper with Habakkuk." Finally, unrelated to all the above but very cool, here are some guys flying jetpacks around a massive Airbus A380 above Dubai.